This chenille sweater knit has been awaiting its turn for absolute ages. I bought it when chenille sweaters became all the rage, and I absolutely had to have this piece, despite the fact that it's not a colour that I would normally choose. It somewhat reminds me of paprika, though there are little bits of all sorts of colours mixed in. It's a loose knit - very stretchy, prone to unraveling. Stands to reason that the style had to be incredibly simple. I used my ancient Vogue 2299 for t-shirt dresses, which is long-time OOP. I added the "wannabe cowl". There wasn't a lot of fabric to play with - must have been an end piece. Hems were a bit of a problem. I tried a few samples, and rather nasty things happened when I attempted to topstitch. Ended up serging the edges to keep stop any raveling, then hemmed by hand. The pants are yet another version of the same as the previous ones from the last batch of corduroy purchased. The colour seemed to be more of a brown in the store, but once I had the piece home it looked to have more of a greeny tinge - reminds me of nutmeg. (Now that's a really odd combination of spices - paprika and nutmeg!) That's alright - it works. Still a pretty basic neutral. Guess I'll be on the look-out at some point for a nice rich chocolate brown. For the moment, though, I think I have enough. Two more pairs of cord pants in the works, and I suppose I should be looking ahead a bit. Time to at least think of spring things, even though at the moment it seems that the world will forever be bleak and cold. I like this business of being able to cut my head off! If my face turns out too weird (which in most photos it most certainly does!) - I just cut it off. Perfect. One more gift done. This one's for my sister - a photo album. I always spend far too much time trying to think up some clever design for these, but in this case the simple stripes work, I think. The fabric is silk dupionni in cream and moss green. I blanket stitched along every seam. The edges are satin stitched twice over in rayon embroidery thread, which is also what the blanket stitch is done in. Now that I see this in a picture, I think that I should have switched to cream thread for sewing on the ribbon, but... too late now. There's been other sewing happening too. I've finished a second pair of cords and another sweater. They still need a final press before they make their closet debut. Had a phone call from my son - the chef's pants are a perfect fit (whew! ), and he's thrilled. Only one small change - he would like the elastic to be a tad tighter. He always, always wore belts with pants. Apparently this is not so comfortable when you wrap an apron around your middle. How am I to know? Minor detail to change on the next pair. I'm itching to make a coat. I'm itching to make a dress. Unfortunately, I have to be sewing my samples for classes. 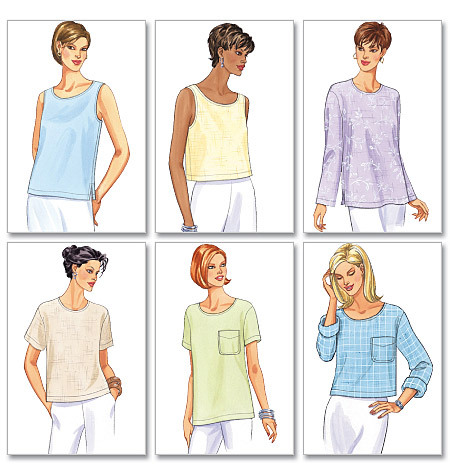 We're doing a series of classes at the store, using the Pamela's Patterns t-shirts. First a class on a basic t-shirt. Then a class using the pattern for different necklines. Then a class on making a dress from the t-shirt pattern. I'm responsible for the second and third of these classes. Somehow I need to get motivated. The open house at the store, when all new samples need to be in place, is in less than 2 weeks, and I'm still only thinking. Problem is - I keep thinking it's so easy - a couple of t-shirts to whip up - no big deal. At the rate I'm going, I'll be sewing them at the last minute, and that really won't do. I cheated with the jacket and pants classes - I hung the silk tweed jacket and camel pants that I made a few months ago, since I haven't worn them yet. I was bad. Very bad. I bought fabric. (Sounds like I'm at an AA meeting for fabricaholics!) I am trying to stick to some sort of a plan to sew clothes that I need right now. Problem is, I'll choose a fabric for a top, with no bottoms to go with it. Or - there's fabric for a bottom, but nothing that works for a top. I already have far too many orphan pieces in my closet to continue willy-nilly, so, you see, I have to buy at least a few pieces to make coordinating outfits, otherwise the whole operation is completely useless. Luck had it, that Fabricland was having one of their 50% off for members sales (Those used to happen only a few times a year, didn't they? Now it seems every time I turn around, there's another message on my phone letting me know of yet another sale.) This one actually worked out quite well for me. I wanted corduroy for pants, and that's all I bought (well, that and a few pieces for sweater dresses, but I'm not counting those, because....). Why corduroy? Because it's comfortable, reasonably warm, and (dare I admit such a thing?) I'm really not much of a jeans person. I'd rather wear cords - not in a jeans style - just a regular trouser/slacks style. So here it is: home outfit #1. Couldn't get rid of the photo assistant to-day. Black corduroy pants Vogue 9537, which I suppose I should now call my TNT pattern. The sweater is an ancient KwikSew 2552. I had a few misgivings about the sweater. When I trolled around the internet for inspiration, I saw long lean cardigans with pockets. This pattern was essentially the same, but... I couldn't remember how it fit. I still have the original, a mohair mix, which has shrunk some from countless washings and is generally relegated to the "something warm to put on when feeling crummy" category. I just decided to wing it. Cut and sewed the x-small. Tried it on. Felt a little baggy. Looked even more baggy. Decided to wear it for a day and see how it felt. This morning I decided that the look was way too baggy. Headed down to the sewing room to remedy the situation immediately, because I had to wear this to-day (don't ask why - just a totally irrational decision). Well, the other reason is that I well know, if something isn't quite right, if it lands downstairs to be fixed, if I don't take more or less immediate action, that piece will languish for months (possibly years) in some basket, not having its fair chance at its own space in my closet. The remedy was fairly simple, in this case. I took another inch seam along both sides (4 inches total), round the underarm and tapered off near the sleeve edge. The pockets became an inch smaller, but they were rather large to start with. The other bonus was fixing the belt carriers. Originally they were sewn into the side seams, which made them stick out on both sides like a pair of ugly ears. Round two - I topstitched them into place, top and bottom. Nice and flat. The belt in the pattern is long for tying. Not a nice look when you put a coat overtop, to have an ugly bulge underneath. Needed something sleeker. I found a click-together black plastic buckle in a drawer, and that solved my belt fastening problem. The sweater fabric is what is called, I believe, a french terry in a dark heathered grey. Loopy on the outside. Smooth t-shirty on the inside. Probably a poly/cotton mix. Been in the stash for eons. Now it's not. Nothing spectacular, but I'm happy to have a new outfit. In case anyone needs to know - peaking out is a white t-shirt from Vogue pattern 7799 (made last year). Sewing right along, here. To-day I finished pyjamas for my daughter. Dark navy blue cotton thermal knit with mauve trim. They're big and baggy, but better that than not fitting. Winter lighting on grey days isn't the best, so it's difficult to get a decent picture, especially of dark fabric. I used some old patterns that I had where I hadn't sliced and diced down to my size. For the pants I used Butterick 6837, and since it's a unisex pattern I cut her the Small. I didn't use the waistband for elastic casing. First I just extended the top of the pants. Having sewn them up, it seemed to me that they were just way too long in the crotch, so I lopped off what I had added. Elastic was serged to the edge, turned and stitched. For the top I used Butterick 5948. Odd things were going on in that envelope. I'd massacred most of the pattern pieces for myself, but oddly enough View E/F bodice were cut at a 12. Just what I needed! The sleeves - well that's another story. They were cut at an 8, so I had to redraw the lines for the 12, so that the sleeves would fit the armholes. Both these patterns are for wovens, but I used a knit, so hopefully that gives even more added ease for just-in-case. For the neck I added a band of "ribbing", which was just a piece of the same fabric. Oh - the trim at the neck is only on the front. It's not stretchy, and I didn't want a case of not being able to poke head through the opening because of lack of stretch. I'm hoping to have Taya here for a visit in the near future, at which point I will measure her and, hopefully, have a much better idea of what size to make for her. Now I do think it's time to take a break from other-people-sewing and make something for me. Don't you agree? Had a bit of a meltdown over the New Year's week-end. Too much happening/not happening in this family and too many me-made presents planned/started/on the go. I pulled myself together long enough to call certain people to warn them that their presents were going to get there eventually/at some point in the future/possibly before summer/as random surprises. I'm now dealing with one sewing project at a time, while trying to deal with everything else. Surprisingly, sewing makes me focus on what I'm doing, makes me forget about other "stuff", and things are getting made - albeit a little more slowly than usual. First done were chef's pants for my son. He's been making do with some black and navy dress pants that I sent to him, but after a year-plus of hard wear, I'm assuming that they're getting a little grungy. He mentioned that he'd been looking to buy some, but all he can find is 100% polyester - not the most comfortable thing when you're in front of a stove for hours on end. After a little research, I came to the conclusion that chef's pants are essentially scrubs. In this case they have to be black -no cute vegetable prints or checks in this establishment. Fabricland had cotton/poly twill - on sale for 40% off, no less! I used KwikSew 2687, which seems to be OOP, but basically it's a men's pyjama/lounge pant. I added a fly. I added belt loops. (I made them 2 inches - hope that's big enough for his belt!) The pattern did include pockets, and I actually followed directions for sewing them in! - well, sort of - I didn't add interfacing, but did multiple rows of topstitching, which I hope will substitute for stabilizing this area, and cute little bar tacks top and bottom of the pocket opening. Got the length from suit pants that are still hanging here. We'll see if these will pass muster, before I sew any more. How did I manage to really stress myself out? Well, of course, as soon as the idea popped into my head, I decided that one pair just wouldn't do - of course, I'd have to whip out at least three pair. Crazy! A saner me realized, that if there need to be changes, and that might well happen, because who knows how these pants are going to fit - better to first make one pair and get some feedback before starting on factory output. That's one parcel sent. Working on the next one. Oh! Guess I should explain the dog license pictures, since some of you did comment on this. Pushkin is an American Staffordshire terrier, and therefore falls into the category of pit bulls. Pit bulls are illegal in the province of Ontario. When this law was put into effect a number of years back, they kindly allowed existing pit bulls to continue existing, but there are a lot of rules to follow and heavy fines to pay, should rules not be followed. We are allowed to be out in public only on a leash with a muzzle. We have to be on time with license payments, and we have to submit mugshots every year for licensing. Pushkin has no clue that he's supposed to be a ferocious animal. My daughter brought him home when he was 4 weeks old (so the vet thought), and he thinks that he's a people. Since I only started blogging about my sewing in October, I don't have a lovely string of pictures to show my accomplishments for the year. However, last January I did start a list of everything I sewed, just to prove to myself that I did accomplish something. I always seem to think that I'm getting nowhere with anything. Mind you, at some points that list went a little haywire, and some things did not get logged into the stats. But this is not "work", so does it really matter? Let's just say that I sewed somewhere in the neighbourhood of 140 to 150 items. Sounds like a lot, hmm. So why do I feel that I have done nothing? Mind you, in that number are some really easy pieces - like 2 tablecloths that only required serging around. Shouldn't have even counted that. There were endless scarves and little bags of one sort or another as well as aprons for gifts, some pillow slips (actually quite a few pillow slips - most of them in white! - you just saw those). I made 8 aprons and 10 duffel bags for the camp where I volunteer in the summer. Boring, boring boring! As far as clothing for other people - well, there were the t-shirts for my daughter, the crazy hooded vest, as well as a shirt and a number of boxers for my son, 5 skirts for my mother, and 2 bridesmaid dresses for my little cousins. Now on to the interesting stuff - the pieces that actually went into my wardrobe. 60 pieces were added to the closet, but somehow it really doesn't feel like it. Granted, a lot were summer wear, and presently that stuff is not IN the closet. (I have to switch things out for the seasons.) A few things were for an occasion, worn only once. Here's the tally. The only reason that I was able to sew so much, is that I have been home this year, and while job-hunting does take up an awful lot of time, it's still not the same as having to go to a job. I'm also realizing that I have been using my sewing as an escape, and while it does keep me sane, it's not the only thing that should be happening in my life. So - on to the sewing plans for 2011. First and foremost - a whole lot less sewing for other people (my children and mother not counting in this). I do not have to produce a handmade gift for every occasion. I should be sewing items that actually fit into my life at the present, instead of things that I think I will need when circumstances change. For the moment, that means more in the line of casual wear for home, which, oddly enough, is the most neglected part of my wardrobe. I do lurk on Pattern Review and Stitcher's Guild, but I'm not too sure that I want to do more than that. Guess I'm afraid that I already spend too much time at the computer, and any more involvement and I'll be regretting it. Reading blogs and blogging is something that I'm enjoying at the moment, and that's what this is all about, eh? I know that at the moment I'm not ready to join in to various sewing "challenges", though the 12 jackets was very tempting. I do enjoy seeing the results of everyone else's efforts, though. So - I'll keep doing what I'm doing, posting my results, and trying not to get so stressed about the whole thing. Does it really matter how many items I produce? Definitely not. What matters is that I'm happy about every project, and mostly that I have fun (what's that?) in the process. Enough of this soul-searching already! I spent an inordinate amount of time the other day taking the requisite mugshots for his license renewal. Whoever came up with that idea has never tried taking specific shots of a dog!